Like most nail addicts, I'm always searching for a new, better base and top coat combo. I recently got to try Barielle Fortifying Nail Builder and Barielle Top Coat, and I am thrilled to say that one of them is a new HG product for me. Read on to discover which one! 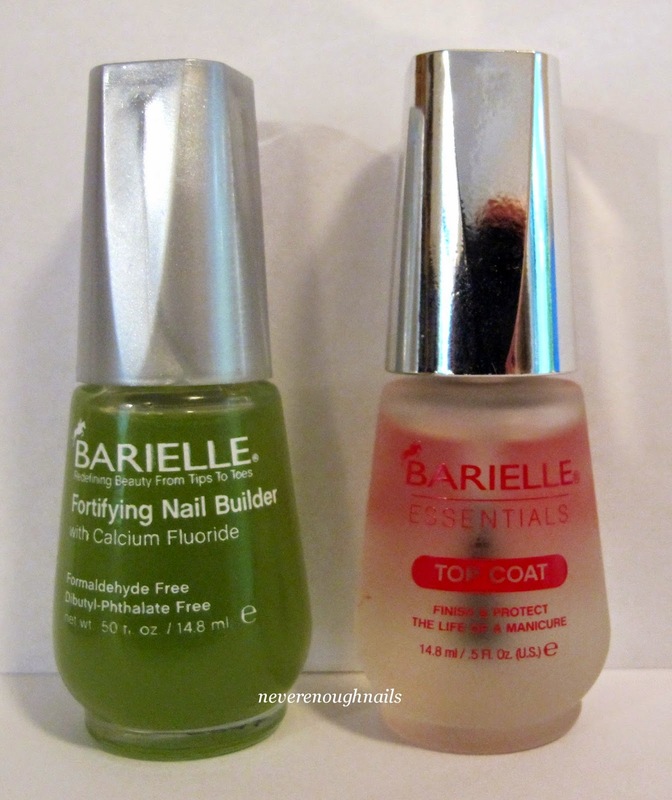 I have been using Barielle Fortifying Nail Builder as a base coat/treatment for the past few weeks. I absolutely love it! My nails looks healthier and feel stronger and less dry. I have very dry nails and when I don't wear polish, the dryness sometimes really bothers me. It feels uncomfortable and I have to keep hand cream or oil on at all times. However, since I started to use this base coat, my bare nails have felt more comfortable and less brittle. I also usually have a bit of peeling on my right thumb nail, but that has almost entirely gone away now! I can hardly believe that, since I've had it for ages. I am still oiling before I apply my base coat because that really helps prolong my manis. Barielle Fortifying Nail Builder wears well as a base coat for me, about the same length of time as my last HG base coat (4 days with no chips). Barielle Essentials Top Coat is a good top coat, but I don't think it's my HG. For one thing, the top coat itself dries quickly, but you have to put it on dry polish or else it smears the polish. So it isn't really good for drying your whole mani. It also is a little on the thin side, so it's not the best for smoothing out glitter. On the positive side of things, I did not experience any shrinkage with this top coat and the wear time was great. I will definitely use this as my top coat for relatively quick drying cremes or shimmers that I want to wear for 4+ days. I highly recommend Barielle Fortifying Nail Builder if you have dry, brittle nails like me. If you mostly wear cremes and shimmers and want a top coat that helps your mani last, check out the Essentials Top Coat too. Both are available at barielle.com. I wear glitter a LOT, like probably 95% of the time. Often my manis are like 7 or 8 layers and I just can't wait for all of that to dry, so I do like a good QDTC! But yes, the base coat is fabulous!